Deer: cute, but may be dangerous to your landscaping! are majestic creatures and have been admired since before the ancient Greeks tied them to the goddess Artemis. Some homeowners love deer watching in their backyards, but this isn’t advisable as they can do some serious damage to your landscaping! Luckily, there are ways of keeping deer away from your yard so your landscape can continue looking great through the fall and winter seasons. Why Are Deer Attracted to Your Yard? Deer love yards for 3 primary reasons. The first reason is that they’re hungry, and, surprise, there’s food on your property! Deer eat almost anything, but they prefer eating plants that offer more than what regular foliage can provide. Some of their favorite plants and flowers to eat include blackberry bushes, juniper, flowering dogwood, fruit trees, clover, sunflowers, wild strawberries, and geraniums. The second reason is that they’re thirsty! If your landscaping contains a pond, trench, a kiddie pool, or a birdbath, this may attract thirsty deer. The third reason is that they love lawn fungi. If you have a lot of mushrooms in your lawn, this may also be bringing the deer to your yard. 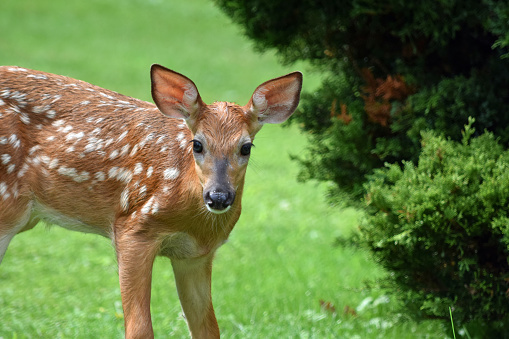 If you want to keep them out, consider adding some plants to your landscaping that deer don’t like. Some good deer-resistant plants include brunnera, Lily-of-the-Valley, sea holly, Virginia bluebells, and lungwort. Keep up with the harvesting of edibles. Install wind chimes, reflective surfaces, and garden ornaments with movable parts. Deer are easily spooked by the unfamiliar. Consider having a fence installed. Use deer repellents, available at your local gardening store. If you go this route, be sure to switch up brands from time to time to prevent repellent immunity, and always reapply after it rains. This entry was posted on Wednesday, October 26th, 2016	at 8:34 pm	and is filed under Landscaping Maintenance	. You can follow any responses to this entry through the RSS 2.0	feed. Both comments and pings are currently closed.